Kyle Lowry is all for Vince Carter retiring in a Raptors jersey. You should be, too. The current Raptors superstar and three-time All-Star told Complex Sports he would be the first to give up his starting spot to see the Raptors legend Carter play “another game with the Raptors and get his jersey put up in the rafters”. That’s just one reason why VC should come back to Toronto. Maybe a retired jersey could even lead to a statue out front by Jurassic Park. 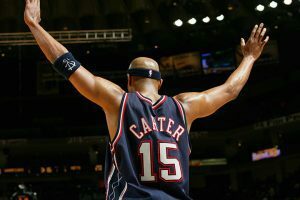 Vince Carter definitely had a multitude of moments that could be frozen in time, for every Toronto sports fan to see as they enter the arena. Elbow-in-the-rim dunk, perhaps? In the late 1990s, professional basketball was not a popular sport north of the border. Vince Carter joined the Raptors in 1998, emerged as a star with his explosive dunks which had everyone tuning in. The only other Canadian pro-ball team ever was the Vancouver Grizzlies. But after five years in the league, they relocated to Memphis. It’s easy to believe that without VC’s presence in Toronto, the Raptors would be nonexistent. Copyright © 2017 NBA Media Ventures, LLC. This is Carter’s 20th year in the league. In 20 years, he has been part of seven teams. If he retires in Toronto, he wouldn’t be seen as some old veteran. The fans would cheer every time he stepped on the court because of what he’s done for the Raptors franchise. What a better way to wrap up your career? The Air Canada Centre will be renamed in January 2018 to the ScotiaBank Arena. If the Raptors can trade for VC before then, or at least have Air Canada return to the ACC before the name change, that would be legendary. The Raptors have made themselves known in the league, with special help from rapper and global ambassador, Drake. Vince Carter would only add to the hype. Does Rajon Rondo want out of Chicago?